Pony E-News: Schools closed for four days, now what? High school staff celebrated the "heat wave" on Friday by donning beach wear to welcome students back to school! See more photos on Facebook. Thank you to our amazing bus drivers who spent the cold days running school buses around the clock to keep the fuel from freezing up. Drivers and mechanics were busy Thursday evening test driving each bus to make sure they were ready to pick up students on Friday morning. At its February 7 meeting the school board is expected to have a discussion to determine if days will be added to the calendar. After missing four days of school this week due to the extreme cold, we now fall below the state-required student contact hours for the year. While the governor says districts will not be punished for closing schools, the Legislature would need to make special dispensation to waive the minimum hours requirement, which to date, it has not done. The school board will be asked to adjust the calendar to recoup instructional hours by holding school on Feb. 18 (Presidents Day), as well as reserve April 19 (Good Friday) as an additional make up day should there be a future snow/cold day this winter. Read more. Stillwater Area High School has rescheduled its annual Pony Possibilities Night for Monday, Feb. 4 from 6 to 8 p.m. Find the schedule and more information online. 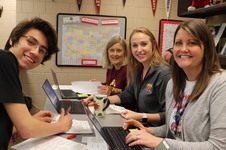 Learn about the ninth grade registration process, check out the many course options available and meet our talented and caring staff. It often takes more than one detective to solve a great mystery. Sherlock Holmes employed the help of Watson. And students at Afton-Lakeland Elementary School looked to buddies at Stillwater Area High School when they needed a bit of help figuring out “whodunit.” Read more. The school district has received the Certificate of Excellence for Financial Reporting from the Association of School Business Officials International for the 15th year in a row. Several of our teachers and staff have been nominated as "Educator of the Year" for the 2019 Community Awards, sponsored by the Greater Stillwater Area Chamber of Commerce. The winner will be announced during the Community Award Celebration on Feb. 9. See the list of nominees online. Please join us in recognizing the unique work that school counselors and student advocates do at every grade level to help children reach their full potential. They support our students academically, socially and emotionally, and can help them with anything from peer relationships to planning for college or career and everything in between. We are fortunate to have such understanding and compassionate staff! Did you know the federal government made a commitment to fund special education by 40 percent, but only pays eight percent of our total costs? The state helps pick up some costs, but there is still a huge gap in what is reimbursed - at a cost of $8 million to our district each year. The governor will be releasing his biennial budget proposal soon, which sets the groundwork for debate at the legislature this year. We rely on the state for more than 60 percent of our budget, which makes these conversations VITAL to our future. Please consider reaching out to Gov. Walz and local legislators to advocate for an increase the state’s share of special education funding to help pay for mandated but unreimbursed special education services. See our school board's legislative platform for more details. Email the governor. Feb. 4: Pony Possibilities Night at Stillwater Area High School for incoming ninth graders, 6-8 p.m.
Feb. 5: Helping students understand emotions presentation by Youth Service Bureau at Lake Elmo Elementary, 6-7 p.m.